Calling all active pups and active pup parents. It’s time to enjoy hands-free running. This Made in the USA, reflective running leash clips to sliding ring on a waist belt so your dog won’t slow you down. It’s actually designed to match your stride by stretching from 34 to 51 inches. And like all Stunt Puppy gear, it’s made to be virtually indestructible. Dimensions: 77" x 1" x 0.1"
These Made in the USA, reflective dog collars, leashes, and harnesses keep up with your pup’s stints and stunts. They’re essentially indestructible. They’re made for the active pup and pup parent. In fact, Maker Ken Goldman took a lot of his cues from rugged camping gear, designing comfortable dog gear that stands up to the elements. The lightweight BioThane collars resist water and odors. Made with material that stays flexible—even in cold weather—these collars won’t pinch the skin or mat fur when your dog runs, plays, and gets muddied up. Ken caters to your active undertakings as well. The Stunt Runner leash straps to your waist so you can walk (or should we say run?) 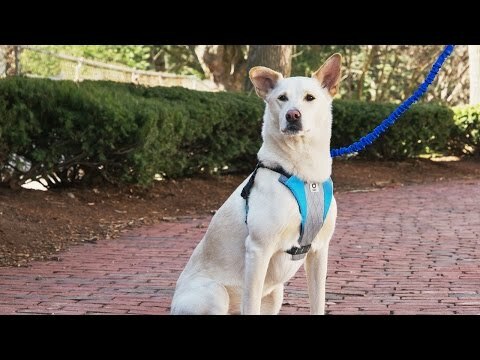 your dog without using your hands. 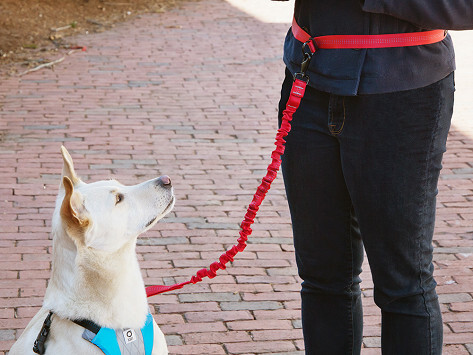 The stretchy material lets the leash get longer and shorter, absorbing variations in your and your dog’s stride. Stunt Puppy tackles any obstacles that might impede your pup’s adventures, giving them gear they’ll forget they have on.